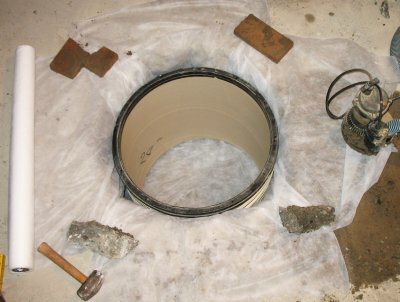 A few other issues I’m contending with are regarding the sump pump: First, the sump (the hole in the basement) isn’t very deep, only about 3 inches. 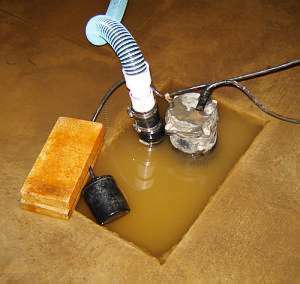 Second the basement floor doesn’t drain toward the sump as well as it should. This leaves puddles up to half an inch deep in places. I rigged up the pump float switch so it will turn on sooner and drain the water down further even though we don’t really have much of a sump hole. I also installed a check valve so the water doesn’t drain back into the basement once the motor turns off. • If I can’t get the water to stop entering the basement I’m going to have to come up with a way to get water to the sump and out of the basement. I’ll probably have to make the hole deeper and possibly wider. My dad was initially concerned that going deeper, thus breaking through the slab floor, would open up another entry point for water. I also need to resolve the puddling issue. I could pour more concrete and try to slope the floor more aggressively towards the sump, but this doesn’t sound like a very easy solution. I did come up with an interesting idea I may try. I’m thinking about utilizing the troughs (pictured here) and building a canal along the entire interior wall that will carry the water into the sump. I don’t know if I would use some kind of rubber or maybe even bricks and adhere / seal them to the basement floor with an epoxy or contractors adhesive (like Liquid Nails). Hopefully it won’t come down to this. • After quite a few cycles of rain, finding leaks, chiseling, patching and sealing leaks, and then waiting for rain, etc. I decided I’d just patch all the vertical mortar joints in the blocks. 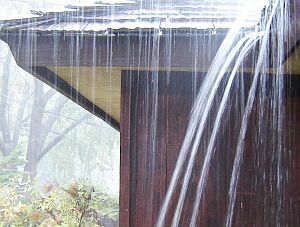 After I did this, I noticed that when the next rain came I had successfully stops the ‘big’ leaks. 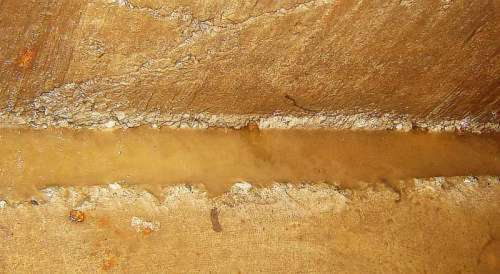 There were still many places where water was leaking into the basement through capillary action in the blocks and through hairline cracks in the poured wall. While this still needs to be addressed, this is much better than the geysers I started out with.